PENDANT SPECIFICATIONS: Brand: Jewelry by Ioka Model No: IG-01-100-0482 Type: Animals Attributes: N/A Stones: N/A Bale Size (mm): N/A Metal: 14K Gold (Not Gold Plated) Average Weight: 0.86 GR Gender: Womens Good for: Chains, Charms, SymbolCHAIN SPECIFICATIONS: Brand: Jewelry by Ioka Model No: IG-01-900-0210 Type: Singapore Clasp: Spring-Ring Width: 1.2 MM Length: 24 inches Metal: 14K Gold (Not Gold Plated) Avg Weight: 1.42 GR Gender: Womens (Unisex)SHIPPING CONTENTS:-14K Gold Chain & Pendant-Jewelry Box-Warranty Certificate-Cleaning ClothLimited Lifetime Warranty: Complimentary repair service on manufacturing defects.Satisfaction Guaranteed: 30 Day return policy for all unworn items.Best in Class Customer Service: Business hours from 7am PT to 8pm PT every day, you can expect a response within 2 hours of emailing us. Outside of business hours, we will return your message within 8 hours. PENDANT SPECIFICATIONS: Brand: Jewelry by Ioka Model No: IG-01-100-0482 Type: Animals Attributes: N/A Stones: N/A Bale Size (mm): N/A Metal: 14K Gold (Not Gold Plated) Average Weight: 0.86 GR Gender: Womens Good for: Chains, Charms, SymbolCHAIN SPECIFICATIONS: Brand: Jewelry by Ioka Model No: IG-01-900-0188 Type: Wheat Clasp: Lobster-Claw Width: 1.5 MM Length: 18 inches Metal: 14K Gold (Not Gold Plated) Avg Weight: 1.69 GR Gender: Womens (Unisex)SHIPPING CONTENTS:-14K Gold Chain & Pendant-Jewelry Box-Warranty Certificate-Cleaning ClothLimited Lifetime Warranty: Complimentary repair service on manufacturing defects.Satisfaction Guaranteed: 30 Day return policy for all unworn items.Best in Class Customer Service: Business hours from 7am PT to 8pm PT every day, you can expect a response within 2 hours of emailing us. Outside of business hours, we will return your message within 8 hours. 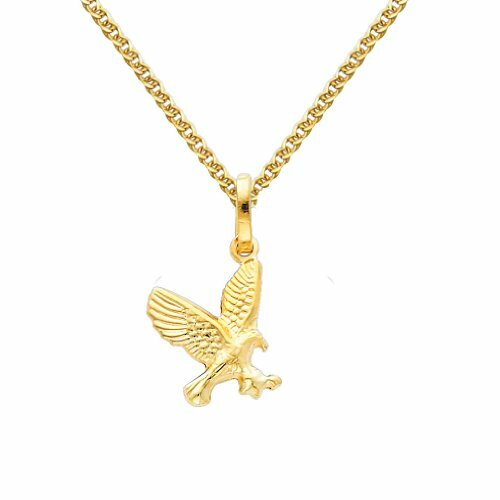 PENDANT SPECIFICATIONS: Brand: Jewelry by Ioka Model No: IG-01-100-0482 Type: Animals Attributes: N/A Stones: N/A Bale Size (mm): N/A Metal: 14K Gold (Not Gold Plated) Average Weight: 0.86 GR Gender: Womens Good for: Chains, Charms, SymbolCHAIN SPECIFICATIONS: Brand: Jewelry by Ioka Model No: IG-01-900-0105 Type: Figaro Clasp: Lobster-Claw Width: 2 MM Length: 24 inches Metal: 14K Gold (Not Gold Plated) Avg Weight: 3.47 GR Gender: Womens (Unisex)SHIPPING CONTENTS:-14K Gold Chain & Pendant-Jewelry Box-Warranty Certificate-Cleaning ClothLimited Lifetime Warranty: Complimentary repair service on manufacturing defects.Satisfaction Guaranteed: 30 Day return policy for all unworn items.Best in Class Customer Service: Business hours from 7am PT to 8pm PT every day, you can expect a response within 2 hours of emailing us. Outside of business hours, we will return your message within 8 hours. 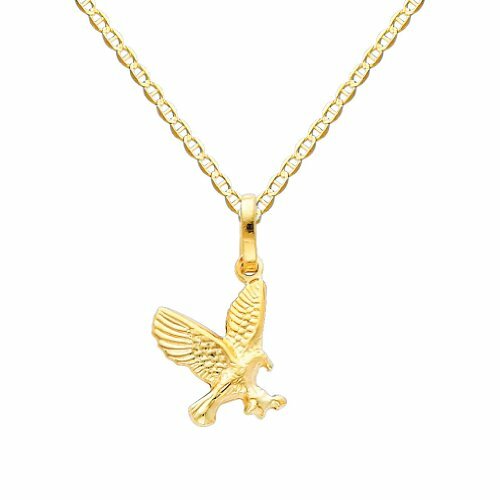 Looking for more Gold Flying Eagle Charm similar ideas? Try to explore these searches: Friends Coat Jacket, Finishing Mower, and Solid Sterling Silver Dolphins Bracelet. 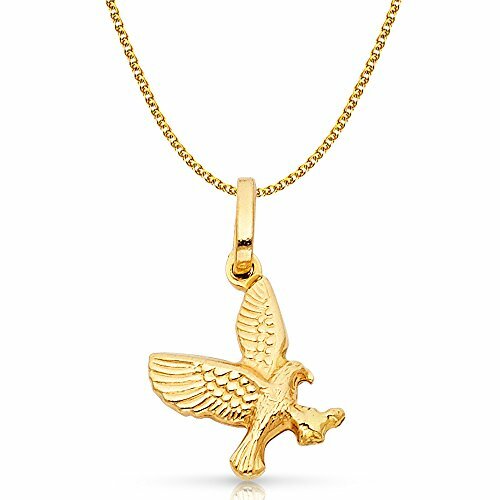 Look at latest related video about Gold Flying Eagle Charm. Shopwizion.com is the smartest way for online shopping: compare prices of leading online shops for best deals around the web. Don't miss TOP Gold Flying Eagle Charm deals, updated daily.